This is just too cute. Love this image and your background - how perfect. Thanks for sharing with QKR Stampede. Wow Mandy what a awesome farewell card for some that adores Giraffe's my best friends son is the same he Giraffe mad and planes. Love your card brilliant image and great design paper totally perfect. Thanks so much for sharing your talent with us over at Sweet Sketch Wednesday 2 and good luck. How cute!!! That image is very sweet and the background paper is perfect!! Great take on the sketch, too! Thanks for playing with Jo's Scrap Shack. Such a sweet giraffe! The background paper is perfect and the touch of sparkle adds a great detail. This has come together beautifully! Love this entry, thank you for sharing with Creatalicious. Good luck and we all hope to see you and your wonderful creations again! Jackie DT member. 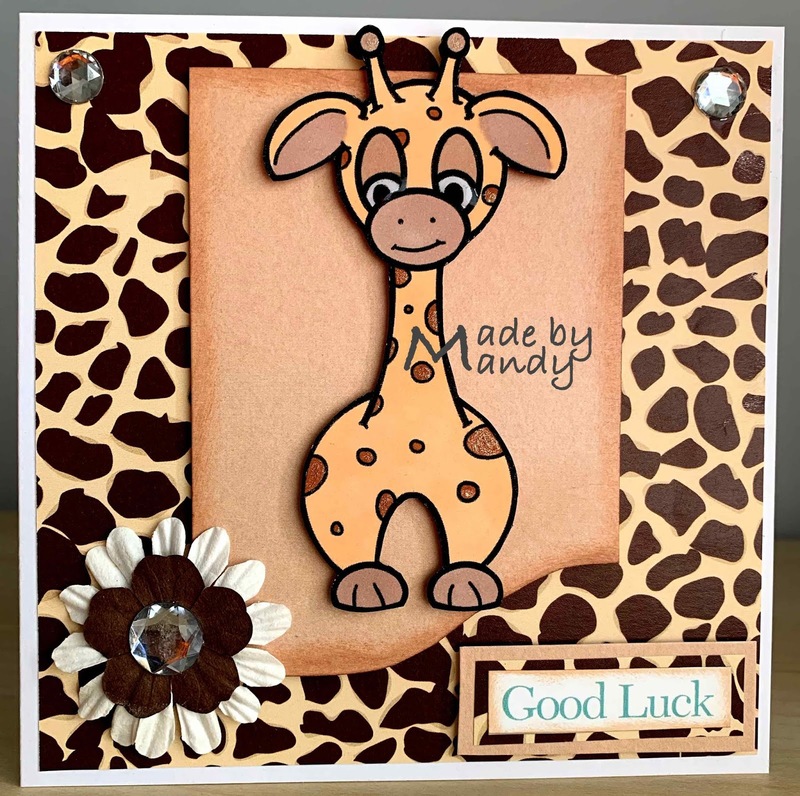 Great card, thanks for joing us at challenge Colour it, Create it, Show it off. Thanks for joining us at 2 Crafty Critter Crazies, Good luck in the challenge and hope to see you again next time! This is a fun project and a great use of the sketch you used. Love your giraffe image it is so cute! Thanks for sharing with us at 613 Avenue Create! Awww this is so sweet, I love that little giraffe! Thanks so much for joining us about at Cardz for Galz. Lovely card Mandy. Thank you for sharing with us over here at Morgan's Artworld Open Challenge and best of luck with your entry. Love to see you join in each month. Thank you. Mandy, Your card is adorable! I think it would make anyone smile and is a perfect fairwell card! Thank you for playing along with us and good luck with your entry! I can't wait to see what you create next! Adorable creation, love the design! Thank you for sharing with us over at Morgan's Artworld Open Challenge. Love to see you join in each month. Oh this is adorable! Wonderful colouring too. Thanks for sharing at A Gem of a Challenge this week. Super cute card and how perfect is that paper!! Thank you so much for joining in at my Crafty Wednesday challenge where it's all about wings, tails or spring blossoms! What a great project! Such a fun design and great take on the sketch. That paper is too fun! Thanks for sharing it with us at Digi Choosday good luck and hope to see you again! Aww this is so cute! Love it! 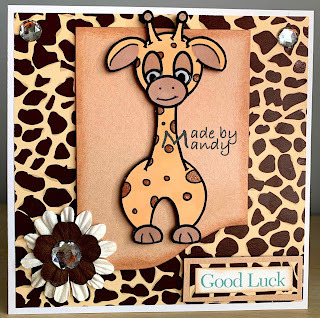 Thank you so much for joining us at Scrapper's Delights challenge blog and best of luck with your entry. Very pretty card! Love that giraffe and the coordinating background paper. Thank you for playing in my Animals challenge at the Alphabet Challenge as well as Cardz 4 Galz and hope you can join us again soon. This is such a sweet image. Simple and gorgeous, thank you for sharing with us. This is absolutely adorable!! The giraffe is too CUTE and I LOVE the giraffe 🦒 themed patterned paper. And that layout! I love everything about this card. Thanks for sharing it with us at the Simon Says Stamp Wednesday Challenge. Such a fun card! So glad you joined us at Morgan's Artworld Open Challenge. Cute card!! Thanks so much for participating in our NOT JUST CARDS challenge. Hope you participate in our next challenge!! Have a happy crafty day!! !